"GoP" redirects here. For abbreviation of Republican Party, one out of two major political party in the United States, see GOP. 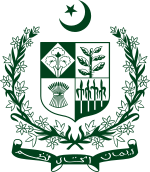 The Government of Pakistan (Urdu: حکومتِ پاکستان‎) is a federal government established by the Constitution of Pakistan as a constituted governing authority of the four provinces of a proclaimed and established by the parliamentary democratic republic, constitutionally called the Islamic Republic of Pakistan. Effecting the Westminster system for governing the state, the government is mainly composed of the executive, legislative, and judicial branches, in which all powers are vested by the Constitution in the Parliament, the Prime Minister and the Supreme Court. The powers and duties of these branches are further defined by acts and amendments of the Parliament, including the creation of executive institutions, departments and courts inferior to the Supreme Court. By constitutional powers, the President promulgates ordinances and passes bills. The President acts as the ceremonial figurehead while the people-elected Prime Minister acts as the chief executive (of the executive branch) and is responsible for running the federal government. There is a bicameral Parliament with the National Assembly as a lower house and the Senate as an upper house. The most influential officials in the Government of Pakistan are considered to be the federal secretaries, who are the highest ranking bureaucrats in the country and run cabinet-level ministries and divisions. The judicial branch systematically contains an apex Supreme Court, Federal Shariat Court, high courts of five provinces, district, anti-terrorism, and the green courts; all inferior to the Supreme Court. The full name of the country is the Islamic Republic of Pakistan. No other name appears in the Constitution, and this is the name that appears on money, in treaties, and in legal cases. The "Pakistan Government" or "Government of Pakistan" are often used in official documents representing the federal government collectively. Also, the terms "Federal" and "National" in government institutions or program names generally indicate affiliation with the federal government. As the seat of government is in Islamabad, "Islamabad" is commonly used as a metonym for the federal government. The Federal Government is Subject to the Constitution. The executive authority of the Federation shall be exercised in the name of the President by the Federal Government, consisting of the Prime Minister and the (Federal) Ministers, which shall act through the Prime Minister, who shall be the chief executive of the Federation. In the performance of his functions under the Constitution, the Prime Minister may act either directly or through the (Federal) Ministers. The basic civil and criminal laws governing the citizens of Pakistan are set down in major parliamentary legislation (a term inherited from the United Kingdom), such as the Exit Control List, the Pakistan Penal Code, and the Frontier Crimes Regulations. By the Article 246th and Article 247th to the constitution, the Islamic Jirga (or Panchayat) system has become an institution for local governance. The 1950s reforms in the government administration, the constitutional law and jurisprudence in Pakistan have been greatly influenced by the United States Of America ' legal system. Since the 1970s, the traditional jirga-based law has also influenced the country's judicial development. The National Assembly is the lower house and has 342 members. 272 are elected directly by the people, while 70 seats are reserved for women and religious minorities. The Senate is the upper house and has 104 senators elected indirectly by members of provincial assemblies for six-year terms. The Parliament enjoys parliamentary supremacy. All the Cabinet ministers as well as the Prime Minister must be members of Parliament (MPs), according to the constitution. The Prime Minister and the Cabinet Ministers are jointly accountable to the Parliament. If there is a policy failure or lapse on the part of the government, all the members of the cabinet are jointly responsible. If a vote of no confidence is passed against the government, then the government collapses and a new one must be formed. By general definition, the executive branch of government is the one that has sole authority and responsibility for the daily administration of the state bureaucracy. The division of power into separate branches of government is central to the republican idea of the separation of powers. The separation of powers system is designed to distribute authority away from the executive branch – an attempt to preserve individual liberty in response to tyrannical leadership throughout history. The Prime Minister of Pakistan (Urdu: وزيراعظم; lit: 'Wazir-e- Azam), is the executive head of government of Pakistan, constitutionally designated as the Chief Executive (CE). Popularly elected by direct elections in the parliament, the Prime minister is responsible for appointing a cabinet as well as running the government operations. The chairmen of large public sector organisations and corporations such as NHA, TCP, PIA, PNSC etc. The Cabinet can have a maximum of 11 percent (50 members including the Prime Minister) of the total strength of the Parliament. Each Cabinet member must be a member of Parliament (MP). The Cabinet Ministers chair the Cabinet and are further assisted by the Cabinet Secretary of Pakistan, whose appointment comes from the Civil Services of Pakistan. Other Ministers are Ministers of State, junior members who report directly to one of the Cabinet Ministers, often overseeing a specific aspect of government. Once appointed by the Prime Minister, all Cabinet Ministers are officially confirmed to their appointment offices by the President in a special oath of ceremony. The President of Pakistan is a ceremonial figurehead, a ceremonial head of state representing the unity of the country. Elected for a five-year term by an indirect election, the electoral college consisting of members of the Senate, National Assembly and the four provincial assemblies, the president is now not eligible for reelection (18th amendment). However no individual may hold the office for more than two consecutive terms. The president may resign or be impeached and removed from office for incapacity or gross misconduct by a two-thirds vote of the members of the parliament. The President enjoys all constitutional powers and exercises them directly or through officers subordinate to him as per the aforesaid Article 41-Article 47. The President is responsible for making a wide variety of appointments. The President is the civilian Commander in Chief of the Pakistan Armed Forces. The President of Pakistan can grant a pardon to or reduce the sentence, reprieve and respite, and remit, suspend or commute any sentence passed by any court, tribunal or other authority, particularly in cases involving a death sentence. The decisions involving pardoning and other rights by the President are independent of the opinion of the Prime Minister or the Parliamentary majority. In most other cases, however, the President exercises his or her executive powers on the advice of the Prime Minister. Pakistan's independent judicial system began under the British Raj, and its concepts and procedures resemble those of Anglo-Saxon countries. Institutional and judicial procedures were later changed, in 1950s, under the influence of American legal system to remove the fundamental rights problems. The judiciary consists of the Supreme Court of Pakistan, Provincial High Courts, District Courts, Anti-terrorism courts, Sharia courts, and Environmental courts all over the country; Supreme Court being the superior court. The Supreme Court of Pakistan consists of a Chief Justice, and Senior Justices appointed by the President after consultation with the Chief Justice of Pakistan. The Constitution does not fix the number of justices of the Supreme Court, though it can be fixed by Parliament through an act signed by the President. The Constitution grants powers to the Supreme Court to make judicature transfers. Although the proceedings in the Supreme Court arise out of the judgement or orders made by the subordinate courts, the Supreme Court reserves the right to transfer any case, appeal or proceedings pending before any High Court to any other High Court. Misconduct of judges is highly intolerable as is mentioned in the constitution. Under the mainframe of the Supreme Judicial Council Article 209 an inquiry into the capacity or conduct of a Judge, who is a member of the Council, may be conducted. The civil service of Pakistan is the permanent bureaucracy of the Government of Pakistan. The civil servants are the permanent officials of the government, occupying a respected image in the civil society. Civil servants come from different cadres (e.g. Pakistan Administrative Service, Police Service of Pakistan etc.) after passing the CSS examinations. Not all the employees of the Government of Pakistan are civil servants; other employees of the Government of Pakistan come from the scientific institutions, state-owned corporations and commissioned military science circles. In the parliamentary democracy, the ultimate responsibility for running the administration rests with the elected representatives of the people which are the ministers. These ministers are accountable to the legislatures which are also elected by the people on the basis of universal adult suffrage. The cabinet and its ministers are expected to lay down the policy guidelines, and the civil servants are responsible for implementing and enforcing it. The federal secretaries are the most senior, experienced, and capable officials in the country. Each ministry/division has its Secretary to oversee and enforce the public policy matters. The secretaries, who are basic pay scale (BPS)-22 grade officers, are largely considered to be the most powerful officials in the country. Management of major crisis situations in the country and coordination of activities of the various Ministries in such situations are the functions of the Cabinet Division. Appointment for the chairman of the FPSC, the prestigious body responsible for the recruitment of elite bureaucrats, is made by the President after consulting the Prime Minister, according to Article 242 of the Constitution. Since 1947, Pakistan has an asymmetric federal government, with elected officials at the national (federal), provincial, tribal, and local levels. Constitution has set the limit of government for five years, but if a Vote of no confidence movements takes place in the parliament (and prelude of movements are proved at the Judicial branch), the government falls and immediately replaced with caretaker government initiated by the president (consultation of Prime Minister also required to make such move), in regards to Article 58 of the constitution. There has been four times that the martial law has been in effect, and controversially approved by the supreme court. Through a general election where the leader of the majority winning party is selected to be the Prime Minister. All members of the federal legislature, the Parliament, are directly elected. Elections in Pakistan take place every five years by universal adult suffrage. There are four provincial governments that rule the four provinces of the state; the Chief Minister heads the state government. All provincial assemblies are unicameral, elected for five years. The Governors appointed by President after consulting the Prime minister, act only as representatives of federal government in the province and do not have any part in running the government. The provincial governments tend to have the greatest influence over most Pakistanis' daily lives. The tribal and Local government functions at the basic level. It is the third level of government, consisting Jirga in rural tribal areas. Pakistan has a complex taxation system of more than 70 unique taxes administered by at least 37 tax collection institutions of the Government of Pakistan. Taxation is a debated and controversial issue in public and political science circle of the country, and according to the International Development Committee, Pakistan had a lower-than-average tax take. Only 0.57% of Pakistanis, or 768,000 people out of a population of 190 million pay income tax. The Finance Minister of Pakistan presents the annual federal budget in the Parliament in the midst of the year, and it has to be passed by the both houses of the Parliament. The budget is preceded by an economic survey which outlines the broad direction of the budget and the economic performance of the country for the outgoing financial fiscal year. Constituted under the Article 160 of the Constitution of Pakistan by the Constitution, the National Finance Commission Award (NFC) program is a series of planned economic programs to take control of financial imbalances and equally manage the financial resources for the four provinces to meet their expenditure liabilities while alleviating the horizontal fiscal imbalances. According to stipulations and directions of the Constitution, the provisional governments and Federal government compete to get higher share of the program's revenues in order to stabilize their own financial status. The corruption is on-going issue in the government, claiming to take initiatives against it, particularly in the government and lower levels of police forces. In 2011, the country has had a consistently poor ranking at the Transparency International's Corruption Perceptions Index with scores of 2.5, 2.3 in 2010, and 2.5 in 2009 out of 10. In 2011, Pakistan ranked 134 on the index with 42 countries ranking worse. In 2012, Pakistan's ranking dropped even further from 134 to 139, making Pakistan the 34th most corrupt country in the world, tied with Azerbaijan, Kenya, Nepal, and Nigeria. However, during Sharif regime (2013–17), Pakistan got improved ranking of 117/180 in 2017 (with an improvement in score 28, 29, 30, 32, 32 [2013-17]), equal to Egypt (better than 59 countries). In 1947–1951, the literacy rate was ~16.40% but literacy rate is now ~69.0% (out of 80.00%). Still, Pakistan has one of the highest illiteracy rates in the world. Since before the collapse of the USSR in 1991, progressive economic liberalization has been carried out by the government both at the provincial and the national level. Pakistan has achieved FDI of almost $8.4 billion in the financial fiscal year of 2006–07, surpassing the government target of $4 billion. Despite this milestone achievement, the Foreign investment had significantly declined by 2010, dropping by ~54.6% due to Pakistan's military operations, financial crises, law and order situation in Karachi, according to the Bank of Pakistan. From the 2006 estimate, the Government expenditures were ~$25 billion. Funding in science and education has been a primary policy of the Government of Pakistan, since 1947. Moreover, English is fast spreading in Pakistan, with 18 million Pakistanis (11% of the population) having a command over the English language, which makes it the 3rd Largest English Speaking Nation in the world and the 2nd largest in Asia. On top of that, Pakistan produces about 445,000 university graduates and 10,000 computer science graduates per year. Despite these statistics, Pakistan still has one of the highest illiteracy rates in the world and the second largest out of school population (5.1 million children) after Nigeria. As per the CIA World Factbook, in 2010, Pakistan ranks 63rd in the world, with respect to the public external debt to various international monetary authorities (owning ~$55.98 billion in 2010), with a total of 60.1% of GDP. Since 2009, Pakistan has been trying to negotiate debt cancellation currently Pakistan spends $3 billion on debt servicing annually to largely western nations and the International Monetary Fund. ^ "About Government". Government of Pakistan. Archived from the original on 24 October 2007. Retrieved 5 March 2009. ^ a b c d e f Govt. of Pakistan. "Government of Pakistan". Government of Pakistan. Government of Pakistan. Archived from the original on 11 June 2013. Retrieved 18 June 2013. ^ "Government tenure ends marking ten years of democracy in Pakistan". www.geo.tv. ^ "Here are the highest paid govt departments - The Express Tribune". tribune.com.pk. ^ Constitution of Pakistan. "Part III: The Federation of Pakistan— Chapter 3: The Federal Government". Constitution of Pakistan. Retrieved 19 June 2013. ^ a b "Chapter 3: Tribal Areas". Chapter 3: Tribal Areas. Retrieved 19 June 2013. ^ a b "Prime Minister of Pakistan". Govt. Pakistan. Archived from the original on 10 July 2014. Retrieved 19 June 2013. ^ Wasim, Amir (15 May 2013). "18th amendment limits cabinet size". ^ a b c d e f g h Information and Mass-Media Broadcasting Ministry of Pakistan. "President". Information and Mass-Media Broadcasting Ministry of Pakistan. Archived from the original on 24 June 2013. Retrieved 19 June 2013. ^ "Prime Minister Imran Khan to chair federal cabinet meeting - Samaa Digital". Samaa TV. ^ a b c d Const. Pakistan. "Chapter 1: The President". Part III: The Federation of Pakistan. Retrieved 19 June 2013. ^ a b "Chapter 2: Armed Forces". Part XII: Miscellaneous. Retrieved 19 June 2013. ^ a b c "Part VII: The Judicature". Retrieved 19 June 2013. ^ "Promotions: PM appoints 15 federal secretaries - The Express Tribune". 7 January 2015. ^ "PM appoints new Cabinet Division, Establishment secretaries - Samaa TV". www.samaa.tv. ^ "Lobbying on for post of finance secretary - The Express Tribune". tribune.com.pk. ^ "Part XII: Miscellaneous". Part XII: Miscellaneous. Retrieved 19 June 2013. ^ "Article 58". 58 Dissolution of the National Assembly. Retrieved 20 June 2013. ^ a b "Chapter 3: The Provincial Governments". Retrieved 20 June 2013. ^ NRB. "The Local Government System 2001". National Bureau of Reconstruction. National Bureau of Reconstruction. Archived from the original on 25 January 2009. Retrieved 20 June 2013. ^ Horrigan, Kevin (26 September 2010). "Take a lesson from Pakistan: Taxes are for suckers". Saint Louis Post-Dispatch. Retrieved 7 November 2010. ^ a b "Stop extra UK aid to Pakistan unless taxes increase, urge MPs". BBC Pakistan Bureau. 4 April 2013. Retrieved 20 June 2013. ^ Ghauri, Irfan (12 June 2013). "Economic plans: Govt set to unveil Rs3.5tr budget today". Express Tribune. Retrieved 12 June 2013. ^ "Govt unveils 'business friendly' budget for FY 2013–14". GEO News. 12 June 2013. Archived from the original on 15 June 2013. Retrieved 12 June 2013. ^ Const. Pakistan. "Finance, Property, Contracts and Suits". Constitution of Pakistan. Constitution of Pakistan. Retrieved 4 May 2013. ^ Sabir, Mohammad. "7th NFC and Its Implications" (PDF). Social Policy and Development Centre. Social Policy and Development Centre. Archived from the original (PDF) on 16 June 2013. Retrieved 4 May 2013. ^ Susan Rose-Ackerman. Corruption and good governa. United Nations Development Programme. p. 4. ^ "Corruption Perceptions Index (2011)". Transparency International. Retrieved 10 December 2011. ^ "Corruption Perceptions Index (2010)". Transparency International. Retrieved 10 December 2011. ^ "Corruption Perceptions Index (2009)". Transparency International. Retrieved 10 December 2011. ^ "Pakistan less corrupt, according to global corruption list". The Express Tribune. 1 December 2011. Retrieved 10 December 2011. ^ 'Rule of law can end corruption in Pakistan' | Asia | DW.DE | 06.12.2012. DW.DE. Retrieved on 2013-07-12. ^ e.V, Transparency International. "Corruption Perceptions Index 2017". www.transparency.org. ^ "Significant Decline In Foreign Investment To Pakistan". Malick, Sajid Ibrahim. 15 February 2010. Retrieved 1 November 2010. ^ Pakistan Literacy Rate. Ilm.com.pk (2010-09-28). Retrieved on 2013-07-12. ^ CIA. "Public Debt of Pakistan". Central Intelligenec Agency (CIA). CIA Fact book. Retrieved 20 June 2013. ^ Pakistan seeking trade, not aid: Gilani Archived 2013-12-26 at the Wayback Machine. Allvoices.com (2010-06-09). Retrieved on 2013-07-12.